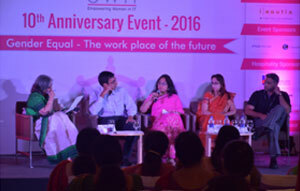 eWIT 10th Anniversary event held on 22nd April 2016 at The Rain Tree, Anna Salai, Chennai on the theme ‘Gender Equal – The workplace of the future’ from 3pm-8pm. Over the past ten years eWIT has worked to increase the 'Share and Sustainability' of Women in the IT/ITES sector. Being Gender-Equal has changed from being a check box item to a business imperative. Look around you-the workplace has changed and will continue to do so. The concern is the pace! Many studies seem to think that maybe 30 years from now we may have a Gender-equal workplace. A lot more women are qualifying and entering the workplace but attrition continues to be a significant problem. While many Companies have 'Plans and Policies' to encourage and retain women, statistics tell another story! But companies are now realising that they cannot afford to lose 'Valuable Talent'. 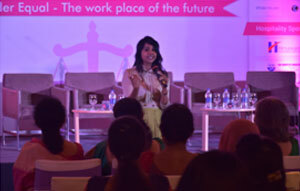 Valuing their contribution to innovation and business growth and keeping women in the workplace has become a necessity. So how do we institute 'real change'? What more do companies need to do? Is it enough if the CEO wants it or do we need to have Managers accountable at every level? Are companies equipped to handle this paradigm shift? What more do women themselves need to do? Let's get together to deliberate on how to make 'Gender Equal' happen fast and more impactful at eWIT’s tenth Anniversary event! Head of Innovation & Technology, Tyco Fire & Security India Pvt. Ltd.